SVM choose the line that maximize the distance of both nearest point. 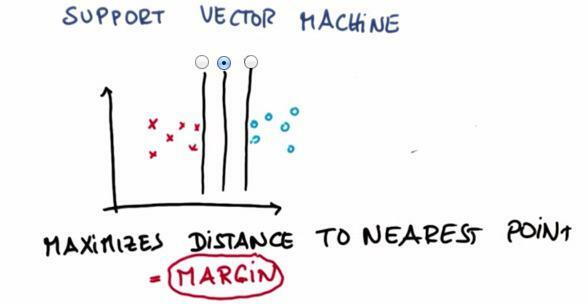 This distance often called Margin.SVM tries to maximize the margin, but also act as other learning algorithm, prioritize the correctness of classifying. Even if there's point that can't be classfied correctly, while retain its largest margin, SVM will treat it as outliers, and can safely ignore the points. But the percentage in which the SVM has firm belief to retain the largest margin, is something called C. Check here to get more intuition about it. It's really just use the same syntax. We're going to have input,output,fit and predict. SVM will gives us linear separable if we're trying to include polynomial features if we're trying to solve non-linear data. The z features, as two dimensional, will consider the problem as top right, making z capable of linearly separating the graph. Adding |x| as new feature, will flip all the point in -x into x+.Which in turn makes the graph linearly separable. For this quiz, the answer should me more training corrects. C works as contrary of lambda, where the larger the C, the more the system overfit the train data. Again, you may check at this link to get more intuition about C value. The Machine Learning nightmare is overfitting. Anything can happen, if not optimal, then you either get underfitting or overfitting. This also take into account that all of these 3, if not tuned correctly will be prone to overfitting. SVM can be at an advantage and disadvantage. If we can see clear distance separable plane between two datasets, then it's a good idea to use SVM. But, because SVM has firm belief(shown by 'margin'), it has weakness in datasets that have close margin. For this, Naive Bayes is recommended. In this mini-project, we’ll tackle the exact same email author ID problem as the Naive Bayes mini-project, but now with an SVM. What we find will help clarify some of the practical differences between the two algorithms. This project also gives us a chance to play around with parameters a lot more than Naive Bayes did, so we will do that too. Only 1% of the features, but over 88% the performance? Not too shabby! It's good sometimes to have lower performance but instance learning. Voice recognition and transaction blocking need to happen in real time, with almost no delay. There's no obvious need to predict an email author instantly. C (say, 10.0, 100., 1000., and 10000.). Which one gives the best accuracy? Over 99% accuracy, pretty good! Hopefully it’s becoming clearer what Sebastian meant when he said Naive Bayes is great for text--it’s faster and generally gives better performance than an SVM for this particular problem. Of course, there are plenty of other problems where an SVM might work better. Knowing which one to try when you’re tackling a problem for the first time is part of the art and science of machine learning. In addition to picking your algorithm, depending on which one you try, there are parameter tunes to worry about as well, and the possibility of overfitting (especially if you don’t have lots of training data). Our general suggestion is to try a few different algorithms for each problem. Tuning the parameters can be a lot of work, but just sit tight for now--toward the end of the class we will introduce you to GridCV, a great sklearn tool that can find an optimal parameter tune almost automatically.